Sorry to hear of the broadband issues experienced but thanks for raising this here for us to look into. 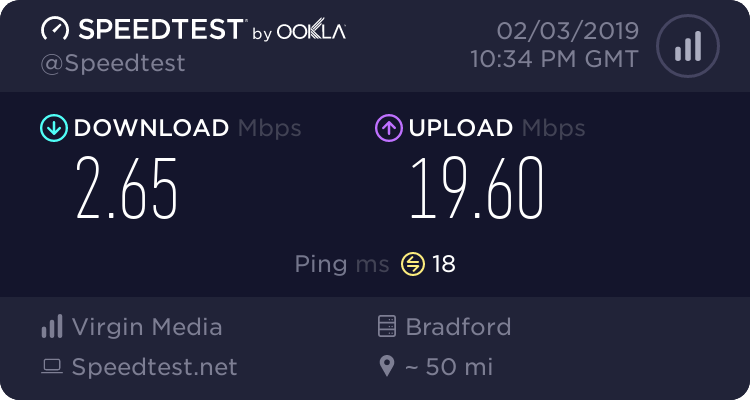 Can you confirm if this is over a wired or wireless connection? Sounds simple but does rebooting both the Hub and the device you're running the test on improve the speeds? After rebooting it would be prudent to repost your stats again but this time with the network logs. Your upstream is running warm with one channel maxxed out and there a a few T3 errors showing in the counters. Thank you for confirming this for us. What device are you using on your wired connection? Do you have a 1gigabit network interface card? Are you using a CAT5e or CAT 6 ethernet cable? Post RS errors building up too quickly. Too many T3 errors - upstream channel 1 is out of power range - needs techie attention not more speedtests. Yeah it seems like it needs attention of an engineer. Dont know how to get one to my address because every time I ring up they say everything's fine, which it clearly isn't. Sorry to understand that you're still having some speed issues - have you downloaded our free Connect App at all? You can scan your network and check for faults - we also have our In-App help if you need it.